Our mission is to inspire our 21st Century learners to achieve their highest academic, social, emotional, intellectual and physical potential potential, becoming problem solvers, critical thinkers, risk-takers, designers, collaborators, and innovators, while developing into contributing, empathetic citizens and leaders who are responsible of their world and care about equity and justice, both locally and worldwide. Reading, writing and math are aligned to the California Common Core Standards (CCSS), which are the end of the year grade expectations for each student. Teachers use a wide variety of teaching materials and curriculum to teach these standards and personalize learning. K-5 teachers district-wide use Lucy Calkin’s Units of Study to teach Reading and Writing Workshop. Words Their Way is used in K-3 classrooms as word study to assist in spelling, phonics and vocabulary. The newly adopted math curriculum, Math in Focus, will be implemented district-wide starting in 2017-18 by all K-5 teachers. Art in Action, supported by the Heather PTA, is provided to all TK-4 students, along with art lessons and activities by each classroom teacher. Student assessments are both formative, forming instruction and summative, evaluating student learning after a unit of study. Heather TK – 4 assessments include ongoing classroom observations and curriculum assessments, Developmental Reading Assessment, DRA, to assess and inform students’ instructional reading levels, DIBLES, to indicate levels of intervention needed in order to be a reader by grade 3, SCSD Writing Assessment on Opinion Writing, CAASPP/SBAC, statewide testing of English language arts and mathematics starting in grade 3, and CELDT to assess English proficiency of all students of a second language. Heather values collaboration amongst teachers, and all teachers collaborate in their teaching on many levels, whether they teach in a single grade classroom, a multiage classroom or a collaborative teaching suite. Multiage classrooms are built by design. Multiage classrooms consist of K/1st, 1st/2nd and K-2, with a possibility of TK/K in 2017-18. Students are expected to “loop” with their teacher for two or three years. Parents can indicate a preference for a multiage classroom. Read more here. Classroom are two classrooms with a large opening between the two rooms with two teachers collaboratively teaching a shared double roster of children. Our 1st grade classroom is a collaborative classroom. Read more here. In addition to multiage, we have single grade classrooms K-4. Due to enrollment numbers we also may have combination classes. Time reading books and being read to by older readers or peers is the main expectation for out of classroom learning. We recognize and encourage family time, play time, and down time as being important for all children, particularly for our young school-age children. Many classrooms, especially in grades 3 and 4 provide At Home Learning menus and connect learning at home activities back to the classroom through At Home Learning Showcases. Read more. The 5Cs consisting of Communication, Collaboration, Creativity, Critical Thinking, Citizenship and Ownership are a the cornerstone of our students learning and are taught and assessed throughout the school year. Read more here. Project Based Learning is a teaching method in which students gain knowledge and skills by working for an extended period of time to investigate and respond to an authentic, engaging and complex question, problem, or challenge. By 2016, all teachers will be trained in the project-based learning (PBL) model of instruction. Learn more here. As we plan to develop and implement a MakerSpace at Heather, many classroom teachers are exploring making, designing and tinkering in the classroom. Design is built into many PBL projects. With the support of the Heather PTA, a PlayPod is being installed on the play yard providing an outdoor area of creativity, building and play. Stay tuned for more soon! Music for Minors is a sequential, in-school music education program that is delivered in alignment with the California Content Standards for Music. SCSD has partnered with Music for Minors to provide music instruction in elementary schools as well as choir classes at both middle schools. Music for Minors provides a weekly program for kindergarten through 4th grade students, offering a variety of hands-on experiences through participation in singing, movement, theory, dance, musical games, and through the use of rhythm instruments and the recorder. The mission of Music for Minors is to nurture love and literacy of music through instruction, participation, and performances — enhancing academic education with musical arts. This program is made possible with the support of the San Carlos Education Foundation. Learn more here. Legarza Sports provides physical education (PE) programs at San Carlos School District elementary schools. They also provide administrative and athletic director services to the after school sports program for the district’s two middle schools. Our younger students in kindergarten and 1st grade also participate in Motor Room to support the development of gross motor skills. Learn more about the SCSD Legarza PE Program. The physical education program is funded in part by the San Carlos Education Foundation (SCEF). FOSS (Full Option Science System) kits are used in grades K-4. FOSS proposes that students learn science best by doing science. Teachers and students “do” science together when they open the FOSS kits, engaging in enduring experiences that lead to deeper understanding of the natural world. FOSS modules integrate reading and language arts skills in context with their science education. Students explore science concepts through hands-on investigations. The San Carlos School District is currently working on an implementation plan to integrate The Next Generation Science Standards into our curriculum. We strive to integrate STEM into our classrooms and through after school activities. STEM is a curriculum based on the idea of educating students in four specific disciplines — science, technology, engineering and mathematics — in an interdisciplinary and applied approach. Heather students participate in STEM activities using Engineering is Elementary, (EIE), connecting engineering design process and math, as well as computer science activities involving coding and robotics. 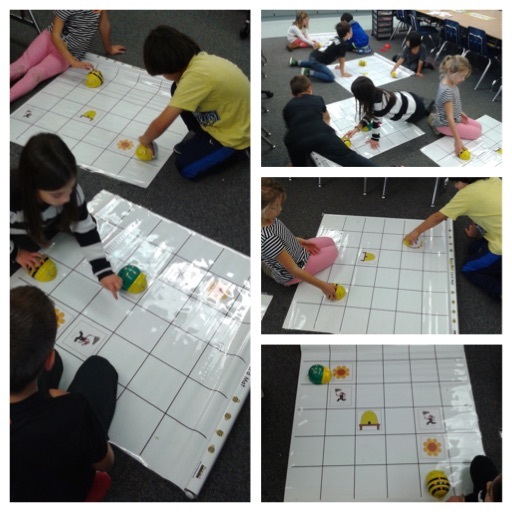 See 2nd graders programming Bee-Bots. In 2015, we conducted a school-wide PBL with the driving question: “How can we, as a school community, develop a school-wide culture of student leadership and service at Heather School?”. As a result we now have students from kindergarten through 4th grade taking on leadership roles in our school community and beyond. Fourth grade student leaders lead us in the Monday Morning Assembly, announce the Friday News and coordinate the Friday Spirit Day competition. Classes of every grade levels take on the responsibility of coordinating a variety of service projects from pajama drives for foster children and collections for Samaritan House to delivering May flowers to neighbors, Valentines for Vets and Relay Recess for the American Cancer Society. Heather School provides instructional support programs for meeting the needs of all children. Student are placed in programs based on individual need as determined by the Student Study Team (SST) and the Individualized Education Program (IEP) process. We deliver programs including academic specialized instruction (SAI) small group learning centers, resource specialist program (RSP), speech and language, adaptive physical education (APE), occupational therapy (OT), and other designated instructional services, including literacy support services. Learn more about Heather support programs here.